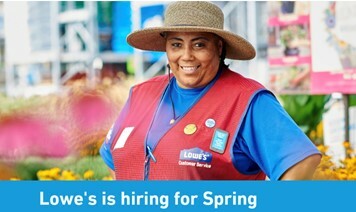 Seasonal Associate Lowe's has seasonal openings for Assemblers, Receivers/Stockers, and Customer Service Associates (CSAs). All employees are expected to provide excellent customer service by greeting customers, responding to customer inquiries, and assisting them in locating, selecting, demonstrating, preparing, and loading merchandise. Additionally, each role has specific responsibilities, for example: assembling merchandise (Assembler), distributing and stocking merchandise (Receiver/Stocker), supporting check out and other functions as needed (CSA Loader), promoting customer loyalty plans and extended protection/replacement plans (CSA Sales Floor) and processing sales and returns using a cash register (CSA Front End). This is not an exhaustive list of duties, and seasonal associates may be asked to help with other duties as needed. Individuals applying for Seasonal Associate may be considered for one of these roles, depending on hiring needs. Job Requirements Morning, afternoon, and evening availability any day of the week, except Receiver/Stocker - late evening, night-time, and early morning any day of the week. Physical ability to move large, bulky and/or heavy merchandise. Physical ability to perform tasks that may require prolonged standing, sitting, and other activities necessary to perform job duties. Minimum Qualifications Assembler & Receiver/Stocker Ability to read, write, and perform basic arithmetic (addition, subtraction). CSAs (Loader, Front-End, and Sales Floor) 6 months of experience using a computer, including: inputting, accessing, modifying, or outputting information AND 6 months of experience using a handheld device (e.g., mobile phone, LRT gun, palm pilot, tablet, iPod) to enter, access, and output information. Preferred Qualifications Assembler & Receiver/Stocker 3 months of experience operating forklift/power equipment such as lifts, order pickers, and similar equipment. CSAs (Loader, Front-End, and Sales Floor) 6 months of retail experience, performing tasks such as: identifying and selling products based on customer needs; explaining warranties, product features, and benefits; assisting customers in locating products; building customer relationships; identifying and resolving customer issues; zone recovery; and housekeeping.